I've never used one photo on a 2 page layout, until I made this one using Graphic 45's (Come Away With Me) collection from FotoBella. The first page is actually the back of the cover page that I made in my last post here. I really wanted to focus on this beautiful photo of my husbands late grandmother, which compliments this collection so perfectly! Along the right side of the photo, I used the Journaling and Ephemera Cards, along with the postage stamps that I cut with decorative scissors from the 12 x 12 Cardstock Pad. All of the edges were inked with Distress Ink (Frayed Burlap). 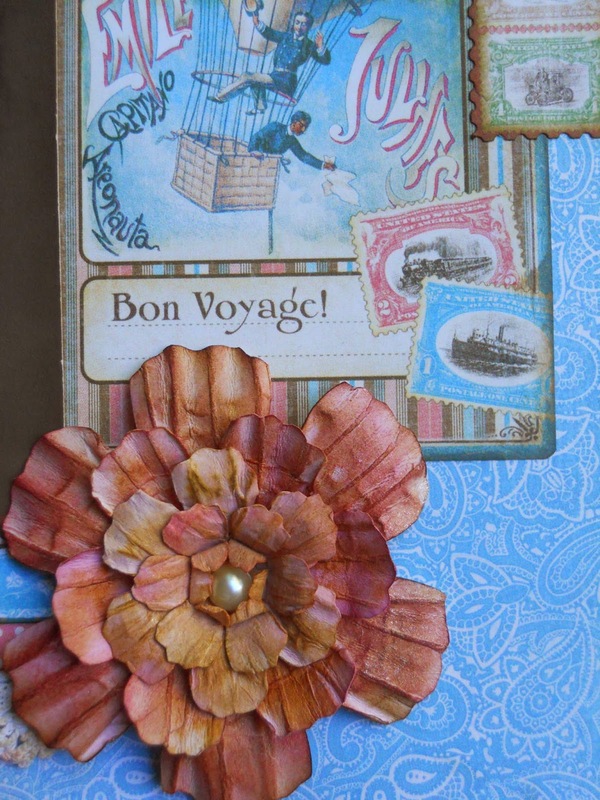 I stamped the date and added the lace trim under the punched paper strip, which I used to tie both pages together. The flower was an extra one that I previously made, and just added the pearl center. I have a tutorial here on how I made them, if you're interested. Thanks for your visit!